My Southern Sparkle: Boobie Prize! 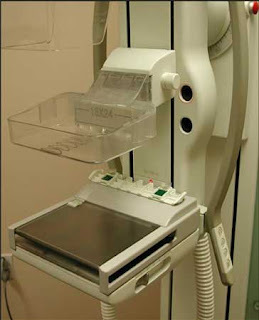 Now, I don't make it a habit to talk about my girls in a public forum, but I wanted to share my experience with my very first mammogram. See, I am real wimp and don't like pain one little bit. Heck, when I was pregnant, I begged my Dr. to start my epidural 2 weeks before the due date...just in case! Pain just isn't on my agenda....really. So, embarrassingly, I have to admit that last year, when my Dr. told me it was time to get this much talked about joy-of-being-female experience done, I kind of skipped out on it. I just didn't do it. No harm, no foul...right???? Come on....work with me here. So, fast forward to this year and my annual physical...Dr. (being all on top of things and all) notices I haven't had my girls checked out when she looks through my file. You know what happens next, right? She tells me about how important this is (I even asked about the "new" guidelines, which she quickly dismissed as garbage). She even goes into great detail about her recent Mammogram and how it didn't hurt...really, she said that. Well, since I am in a season of life where I need to get everything in order for this upcoming move, I decided to schedule the test. My head started swimming when I called for an appointment and they could see me so quickly (in less than a week, when I was figuring a month and knowing myself would probably managed to talk myself out of doing it ~ again). Anyway, I went this morning for an 8:30 am check in for a 9:00 am scan. You won't believe it! It was more spa experience than squish the girls until they scream experience. The imaging center I went to was very peaceful, quiet and a bit posh. The technician who performed the test was super sweet, gentle and understanding about my great fear of pain. Honestly, there was no pain. It was more like some pressure, but nothing even vaguely what I expected! AND I was finished and out of there at 8:55 am. So, why am I talking about this - here in public? It is because breast cancer is serious stuff and I lost a dear friend to this awful disease 6 years ago and know so many others who have lost dear, precious women to it as well. If you have been putting off getting your Mammogram (like me) I encourage you to go get it done. I didn't hurt a bit...REALLY. Funny and inspiring post. Thanks for all your kind words. I need a mammogram... I better get one done soon. I get my first boobie prize next year. I can only hope for as good an experience. Ooohh I am so glad you shared this, because I have heard so many horror stories about how awful it is... I'm glad to know that the technique and experience doesn't always have to be bad! I definitely have one every year! No much fun and quite stressful until the results arrive in the mail. I would love to know what facility you had your mammogram done at. I live in your area and am supposed to have one later this year. I'm glad you had a good experience with it.